DENVER -Armstrong Steel Building Systems, a Colorado company, proudly announces its ranking of #11 among the Top 100 Construction Companies nationally in Inc. magazine's 2013 Inc. 500, an exclusive recognition of the nation's fastest-growing private companies. The list represents the most comprehensive look at the most important segment of the economy-America's independent entrepreneurs. For 32 years, Inc. has welcomed the fastest growing private companies in America into a very exclusive club. Make no mistake: The club is more exclusive this year than ever in its history. Simply to make it onto the Inc. 500 this year, a company had to grow more than 918 percent from the start of 2010. The average company on the list grew a mind-boggling 2,900 percent. Those are results most businesses could only dream of in the economy of the past three years. 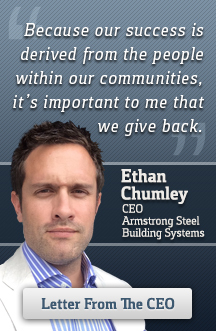 "Armstrong Steel is honored to be recognized as one of the United States' fastest-growing companies," said President, Ethan Chumley. "Our company has grown exponentially to just over 50 full time employees-and we don't plan on stopping there. We offer innovative building solutions with competitive prices in a staggering economy. Recognition within this national arena as #11 in the Construction Industry, a 1,438% percent three-year growth rate, and ranking No.10 among all private companies in the state of Colorado is a notable accomplishment. Congratulations is in order to each and every one of our hard working team members." "Armstrong Steel Building Systems crafts unique, cleanly designed, meticulously engineered, top of the line buildings that match our clients' lifestyles. Our culture has embodied a sort of fanatical attention to detail. Each Armstrong building is designed by a small, handpicked team of designers. They are extremely close, focused and committed to the same goals. Once we understand your construction goals we promise to create a building experience that helps to solve your problems and ensure that your building reaches beyond you to improve the lives of the folks within your community. You may only do this once! Let us be a part of your endeavor. We promise, you won’t be disappointed,” said Jeremy Bjork, Sr. Project Manager. At Armstrong Steel, we understand that not all our customers are alike. We have some customers who understand all of the technical nuances of contracting and have the capability of doing everything themselves. We also have customers who are completely new to the idea of managing their own building project and we recognize that the experience can be intimidating. Bottom line? Some of our customers will need a fair amount of hand holding and that's OK! We love sharing our knowledge and expertise with new customers. We'll show you how to cut out the middleman or we'll put you in touch with an Armstrong dealer who can manage your entire project - start to finish. We work to cater to all those savvy customers, all the "newbies" and everyone in between. Visit Armstrong Steel today at http://www.armstrongsteel.com or call 800-345-4610.